Recently, I ordered this book High Vibrational Beauty: by the Founders of CAP BEAUTY, Kerrilynn Pamer, and Cindy Diprima Morisse. I loved this easy recipe for an at-home beauty mask. You may have to run to the store to get a few of the items but I am sure you will find a use for them, other than in your mask. This book is cool! It has beauty rituals, beauty elixirs, teas, healthy food recipes, and grounding/ meditation info. Just an overall informative, beauty and health-conscious, resourceful, fun book! I tried this brightening mask and it was really nice! It felt really good and hydrating. This mask is high in Vitamin D and E, purifying, calming and anti-inflammatory. My skin feels really supple and soft. Though when making it, use the matcha tea liquid mix cautiously, as you only need a little bit. You want this mask to be like a paste. I overdid it and used too much matcha and water mix, so I had to add more honey or you can add more chlorella. I usually wait till the day after my masks to see results. You will want to leave the mask on for 20-30 minutes and you can do this mask 1-2 times a week. 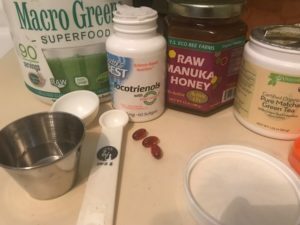 Recipe: Matcha, water, tocotrienols(vitamin E family), manuka honey, chlorella and a small ceramic bowl and brush. I substituted a green powder blend I had with chlorella in the mix, as I didn’t have it solo. Directions: Whisk or Stir 1/2 tsp match into 1 TBS of water, push aside in one bowl. Then with the other bowl, 1/2 tsp of tocotrienols,1TBS honey, 1 tsp chlorella, mix well with the brush. Take the matcha mixture and slowly pour over the honey mixture to create a paste texture. Be CAUTIOUS of making it too thin! If need be, to make it thicker, add tocotrienols and honey.